If you have slate or flagstone on your property, then you know that it can get damaged and worn down very easily. Luckily, the experts here at Squeeky Clean offer comprehensive slate and flagstone restoration services. Whether you need your surfaces cleaned, sealed, or power washed, we’ll get the job done right. To read more about our great services, check out our past blog posts. When you do so, you’ll find extensive information on our brick and masonry restoration as well as our deck repair service. Here at Squeeky Clean, we’ve come to specialize in restoring slate and flagstone to a pristine appearance. One way that we do this is by power washing the stone using a high volume of water and heat. To remove existing mold, mildew, stains, and fungus from flagstone or slate walkways, we may also use environmentally friendly cleaners. 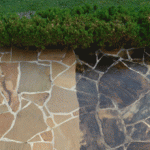 If you’re interested in protecting your flagstone and slate surfaces from erosion and flaking, then you may want to consider letting us seal your walkways for you. To preserve your slate and flagstone, we use contractor-grade sealers which last far longer than those sold at home improvement stores. After being treated with our sealers, your walkways will remain in great condition even when exposed to heavy foot traffic and the elements. We offer several different sealer options, and we’ll be happy to help you select the best one for your needs. If you’re ready to have your flagstone or slate restored by a skilled professional, then it’s time to contact Squeeky Clean Services. To get a free estimate for your job, simply give us a call at 215-836-9274 or visit us on the web. We look forward to showing you why we’ve been the trusted contractor for power washing, gutter cleaning, home restoration, and much more since 1986!